Best 2 Pepper Spray Guns For Self Defense! Pepper spray guns are replacing the old canister type pepper sprays because they are more elaborate, and have the ability to hit an attacker from a significant distance and for longer periods of time. These pepper guns typically come with canisters and they are now designed to fit comfortably in a women's purse and in a women's hand. Two of the more popular pepper spray guns are the Kimber Pepper Blaster II, and the Mace Pepper Gun. Let's take a look at both and review both the good and bad of each spray gun. The Kimber Pepper Blaster II Pepper Spray Gun comes with an ergonomic pistol grip and two sights to increase accuracy. This little blaster actually looks like a small ladies handgun, and is capable of hitting an assailant at up to 13 feet away. The Pepper Blaster II is great for those women who take walks or jogs in the park and fear either an assailant or even a dog may attack them. The gun comes with two charges that are filled with pepper spray. When you aim this gun at a target, the spray releases at 90 mph and when it hits the target will debilitate them for over 45 minutes to an hour. More than enough time to contact the police or simply get away. 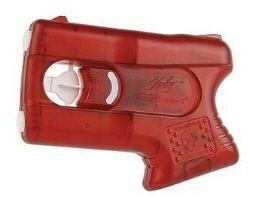 This pepper spray gun works for left or right handed people and has a wrist attachment if needed. One of the only drawbacks of this particular Kimber spray gun is it has no clip to attack it to your handbag or purse as in many of the previous Kimber models. That being said, this gun packs enough liquid irritant to drop almost any attacker in his tracks. It is small enough, at 4.7" L x 1.0" W x 3.3", to fit in any size handbag. One of the better features of the Kimber Pepper Blaster II Pepper Spray Gun is that the spray releases at such a high velocity that there is almost no chance of hitting or contaminating anyone other than the person your are targeting. A must have for anyone who is out alone especially at night. 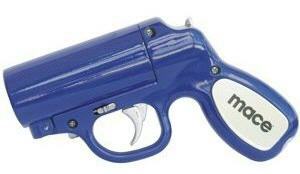 The Mace Pepper Gun closely resembles a hand gun and has the ability to reach a target at 20 feet away.This pepper gun has a mechanism that prevents the gun from going off accidentally. You have the ability to simply replace the empty cartridge that holds the pepper spray. If you are looking for a pepper spray gun with accuracy, then this gun has it all. In addition to the distance this gun can reach, it comes with the advanced bag-in-a-can technology allowing you to spray one constant stream at your attacker. One cool feature of the Mace Pepper Gun is when you pull the trigger, a LED light signs and disorients the attackers vision for a brief second, allowing you to accurately aim and shoot. This feature is ideal for low lit areas. The gun does come with batteries to allow the LED to work, and each gun comes with a 28 gram OC cartridge and a water cartridge to practice aiming the gun properly. 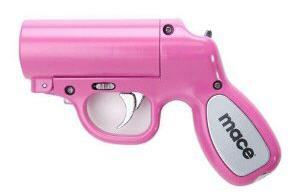 One of the only drawbacks of the Mace Pepper Gun is that is resembles a hand gun so much, you run the risk that it could be mistaken for a real gun. The gun has so many of today's advanced features that if you find yourself in a situation where you needed to defend yourself, the Mace Pepper Gun will get the job done for you. Of the two best pepper spray guns we favor the Mace Pepper Gun because it is durable, accurate, and the added feature of a LED light that can disorient your attacker is a big bonus.